Floriade is an annual festival in Canberra where over a million flowers are brought together in big, bright displays around a large area of Commonwealth Park in the centre of town. It is the largest floral festival in the southern hemisphere, apparently! The free festival counts hundreds of thousands of visitors each year (although that includes repeat visitors) over a period of one month in September-October. Last year there were nearly half a million visitors. I think my first visit was in 1993, when I was in 6th grade, and I wandered through a few times when I was in university (the site is a half hour walk from campus). My most recent visit was this week – a few friends were visiting from Sydney and I spent a lovely hour wandering through it with them. 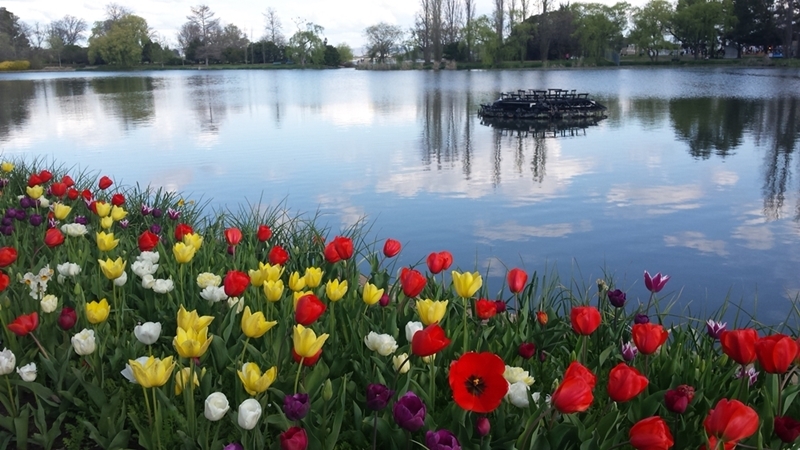 The first Floriade happened in 1988 and was intended to be a once-off event marking the bicentennial of European settlement of Australia. The theme was multiculturalism, and included Aboriginal floral designs. It also had a strong Dutch connection – inspired by the famous Keukenhof garden in Lisse, sponsored by the Dutch embassy, and including some Dutch inspired floral designs. Keukenhof means kitchen garden, and the Keukenhof Garden in the Netherlands (also known as the “Garden of Europe”) has about 7 million flowers over 80 acres. This beautiful garden bed is in a Southern Cross design – it was one of my favourites. The flowers are mostly bulbs in bright colours – tulips, daffodils, bluebells, hyacinth and the like. There are also annuals like pansies and poppies. Usually it is the tulips that stand out most (to me at least) with a wide variety of sizes, shapes and colours. This year I was particularly taken by huge red tulips (reminiscent of the red poppies used for remembrance), frilly pale yellow tulips with petals like skirts, and variegated red-and-yellow tulips. Oodles of tulips! Including the red-and-yellows I really liked at the very front. This garden bed was a design representing the eternal flame. 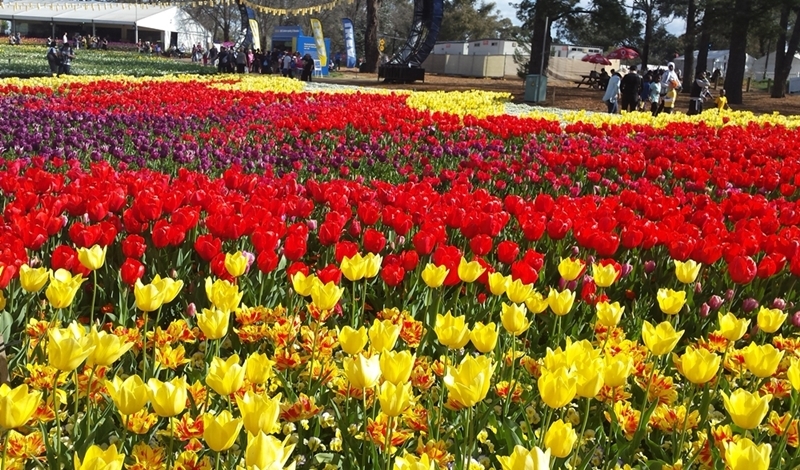 Floriade has become quite a festival, with more than flowers. There are concerts, stalls selling food and more, kids’ activities and rides. There is a ferris wheel, and a gnome-painting competition. We actually looked through the display of painted gnomes and were impressed by how interesting some of them were. All in all it was an enjoyable outing on a beautiful Spring day. Surrounded by all that colour, with clean blue skies above, I couldn’t help but marvel at how different my life is now than it was just over a year ago, when I was shrouded in smog more often than not. Wow! Look at all those pretty colors!